Beautiful Maddy, with her soft grey coat, was born in May, 2017. She was found in the backyard of a family who had moved away. Was she abandoned by them? We’ll never know. What we do know is that she is a sweet and mellow girl who is hoping so much that she’ll find a forever home with a loving family. Perhaps YOU are the person who will make her wishes come true! 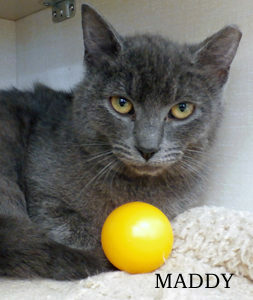 Stop by to visit with Maddy and see what a truly sweet girl she is! This entry was posted in 6 to 12 Months, Adopted, Adopted Cats, Cats, Female, Petco - Syosset. Bookmark the permalink.